The powerful, flexible and composable FWS-7821 builds upon the FWS pedigree as the next generation of easy to manage, rapidly deployable, intelligent security appliances featuring IPMI, TPM, Unified Threat Management, and Intrusion Detection & Prevention. Designed around a 7th Generation (Kaby Lake) Intel® Xeon® processor, the FWS-7821 supports up to 64GB DDR4, 2.5" SSD x 5, or 40GbE QSFP x 2 to deliver unrivalled processing, massive throughput, and ultra-low latency. 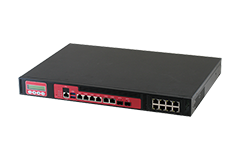 The FWS-7821 ensures rapid and composable deployment in your network environment. The powerful SDK further enables high degrees of customization in addition to real-time telemetry, analytics, and ease of management.